K&L Electrical can offer PAT testing (portable appliance testing) services in the Manchester, Liverpool, Warrington and St Helens all around the North West area providing support from letting agents to landlords and full commercial installations. We also offer PAT Testing for shops, businesses, council and public sector organisations, rented property and residential care homes. K&L also carry out electrical PAT testing for insurance companies and for licensing purposes (including public entertainment licences) for theatres, pubs, clubs and hotels. Portable Appliance Testing (PAT) is the electrical safety testing of portable electrical equipment. It consists of a visual inspection and various electrical tests carried out using electrical safety testing equipment. Appliances that have passed are deemed to be safe to use until the next test date. A sticker is attached to the equipment (see example to the right) indicating a pass or fail and the next applicable test date. 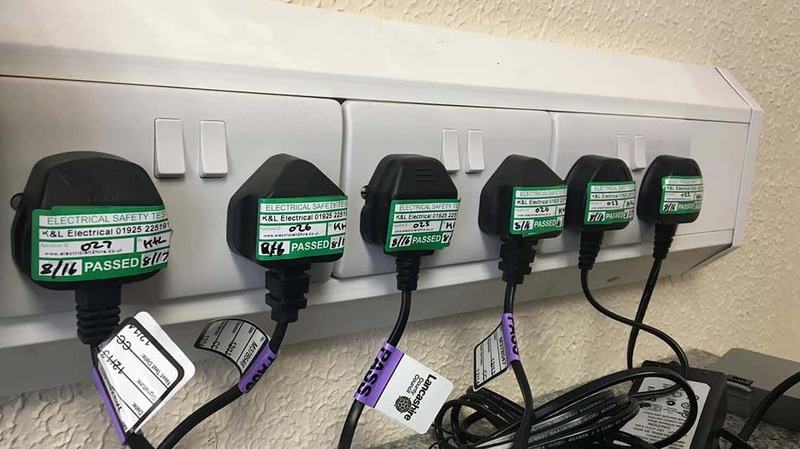 The intervals between PAT testing are normally 12 months but in some cases they can be 24 months between PAT testing depending on the environment. Asset Tracking Service – Make / Model / Serial Number/ Location – an additional £1 per item tested. Antibacterial cleansing wipes over each item tested (suitable for computers, monitors, printers, cash tills or any handheld portable appliance including phones etc.) – an additional £1 per item that is PAT tested. You could also have a periodic inspection report / electrical condition report done at the same time as the PAT testing. A periodic inspection report will reveal if any circuits or electrical equipment are being overloaded, and locate any potential electrical shock risks.